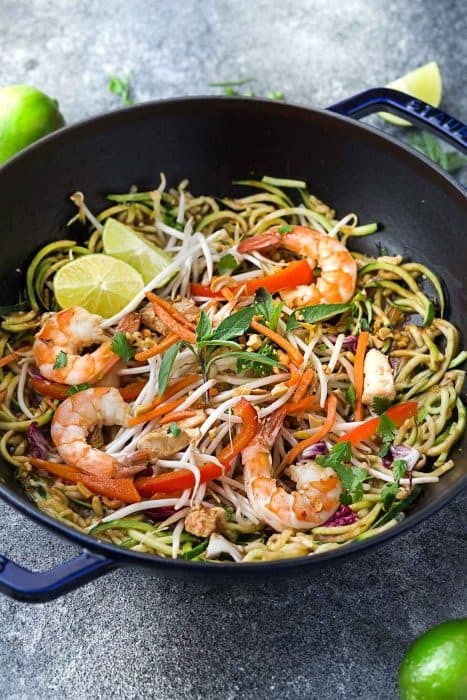 Pad Thai Zoodles – this recipe has all the flavors of our favorite Pad Thai dish and come together easily in just one pan. 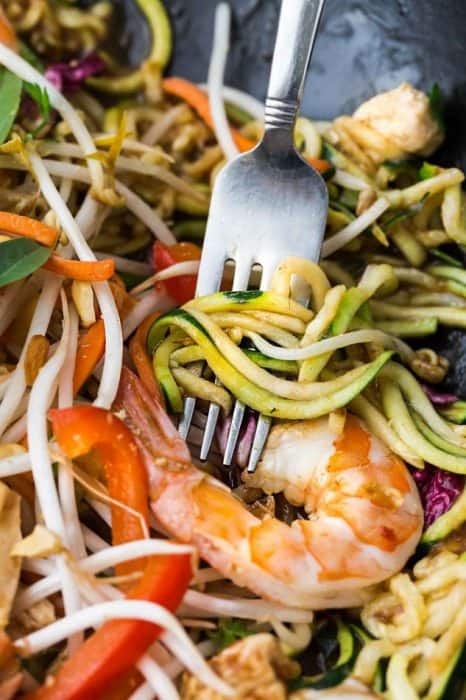 Made with vegetables, chicken, shrimp and a flavor-packed homemade Pad Thai Sauce that’s the perfect balance of sweet, spicy, and tangy! 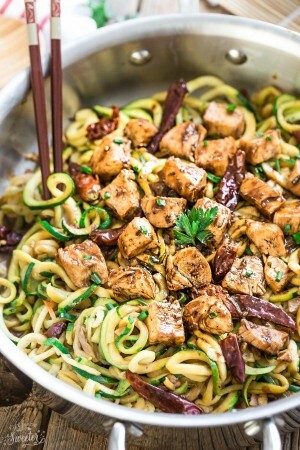 For the spiralized zucchini noodles, you can either use a spiralizer or juienne peeler which works just as great! 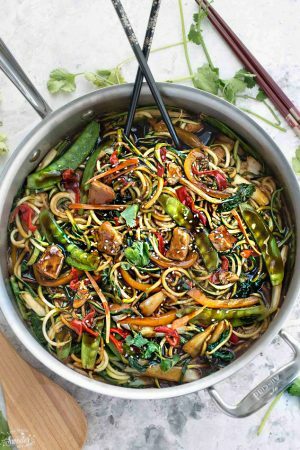 In addition to the zucchini noodles, you can use any combination of vegetables that you like or have in hand. I also added chicken and shrimp for the protein but you can easily leave out any (or both) according to your taste. The homemade Pad Thai sauce is full of my favorite signature sweet, spicy, tangy and savory combo. 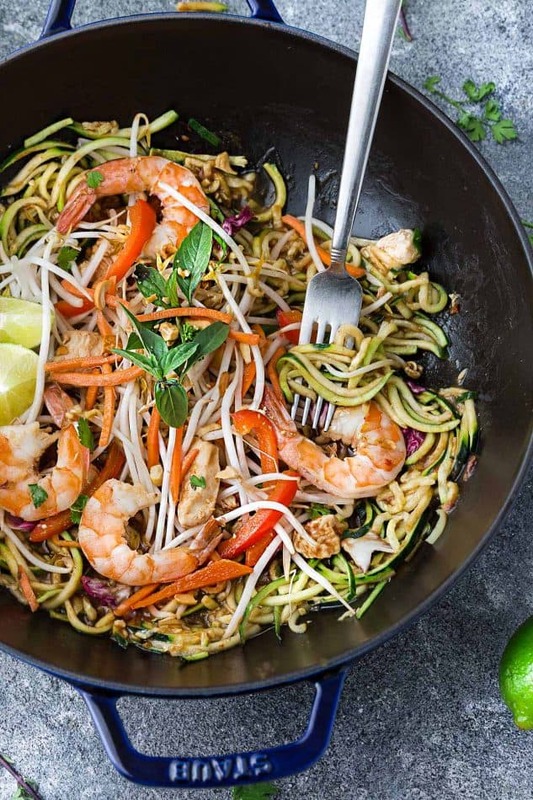 These Pad Thai Zoodles are a summertime favorite and a delicious lower carb option when you’re craving the popular takeout dish. 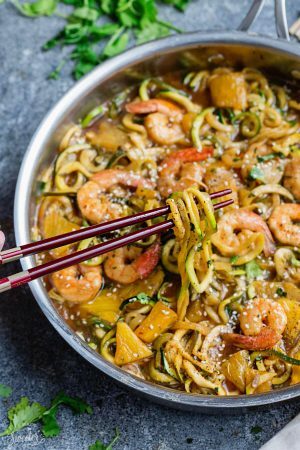 Pad Thai Zoodles (Zucchini Noodles) - is the perfect healthy and tasty stir-fry dish to use up that garden zucchini! 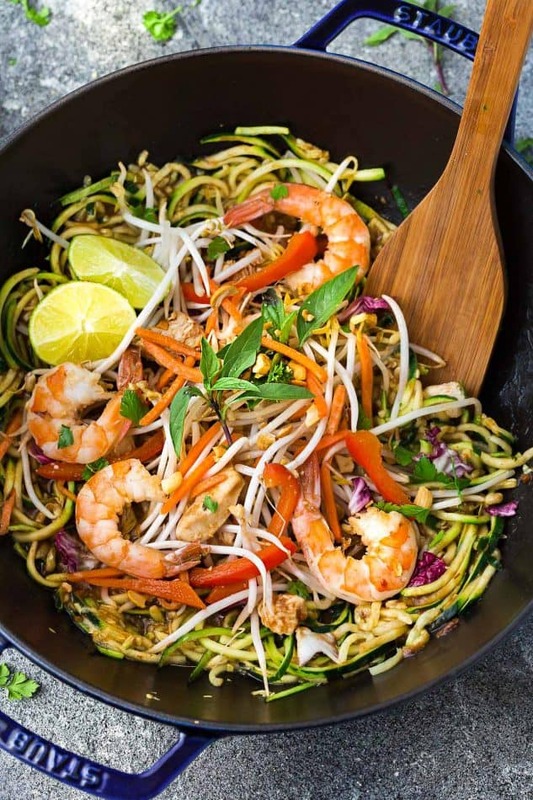 Loaded with vegetables, chicken, shrimp and a flavor-packed homemade Pad Thai Sauce that’s the perfect balance of sweet, spicy, and tangy! Season chicken with salt and black pepper. Set aside. 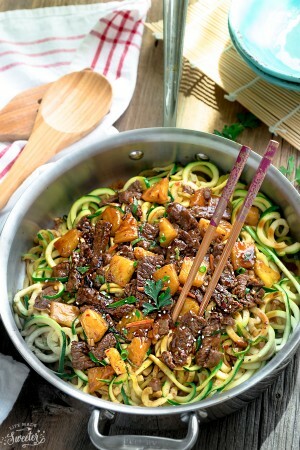 Spiralize the zucchini into noodles using a spiralizer or a julienne peeler. Blot with paper towels to soak up any excess liquid. In a medium bowl, combine all the sauce ingredients. If you prefer a sweeter pad thai - add additional sugar. For a spicier version, add additional chili paste. Heat 2-3 tablespoons of oil in a large wok or non-stick skillet over medium-high heat. Add the chicken and cook until mostly cooked through (about 1-2 minutes). Add shrimp and continue stir-frying 2-3 more minutes, or until shrimp are pink and plump. Transfer to a plate and set aside. Add remaining oil to the same pan and add the garlic, ginger and shallots and cook for about 30 seconds, until fragrant. Add the carrots and bell pepper and cook for 1-2 minutes, until tender crisp. 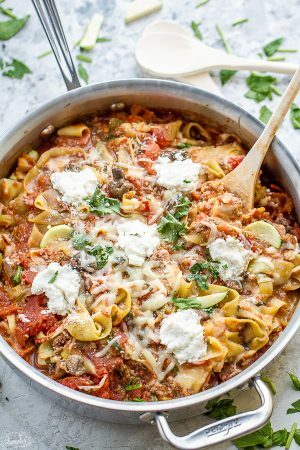 Push all the ingredients over to one side of the pan. Pour the beaten egg and scramble directly in the pan. Squeeze in juice from lime wedge and adjust seasoning by adding some salt, black pepper, fish sauce and chili paste. Serve hot on a large platter with garnishes by sprinkling on cilantro, bean sprouts, red cabbage, peanuts and additional lime wedges on the side.